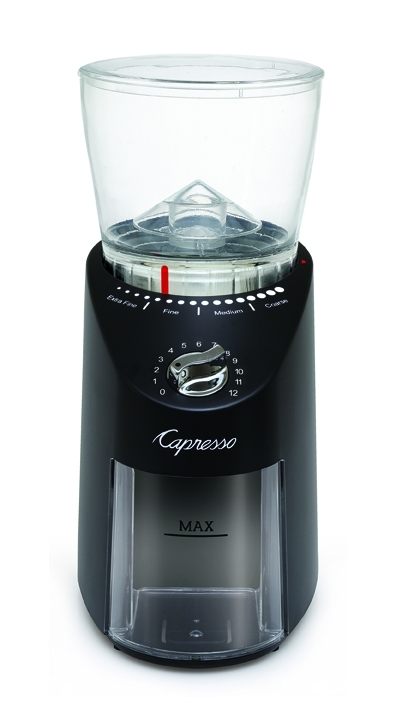 The Capresso Infinity Plus coffee grinder uses the same burrs as found in fully automatic commercial machines. The advanced conical burr design and gear reduction motor creates less friction and heat, preserving maximum flavor and aroma in any grind setting. The slow grinding minimizes static build-up. Select from Turkish fine, espresso, drip or coarse for French Press. The settings are marked into 4 categories: Extra fine, Fine, Medium and Coarse for ease of use. Set the timer to grind from 5 to 60 seconds. The bean container holds 312 grams (11 oz.) of whole bean coffee and must be in place for the grinder to operate (Safety lock mechanism). The removable ground coffee container holds up to 4 oz. of ground coffee. 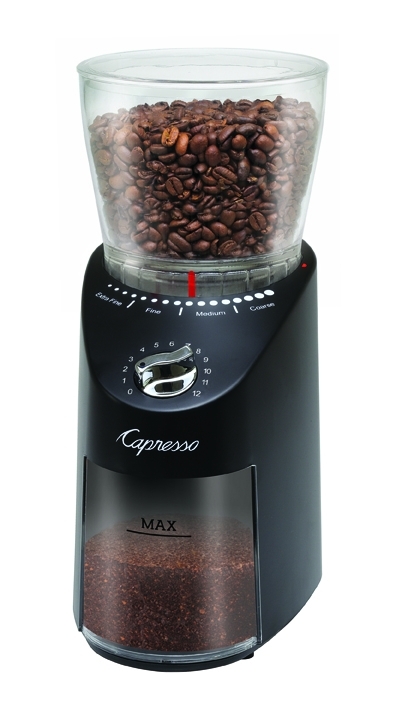 The advanced design holds the ground coffee container in place and keeps it completely sealed during grinding. 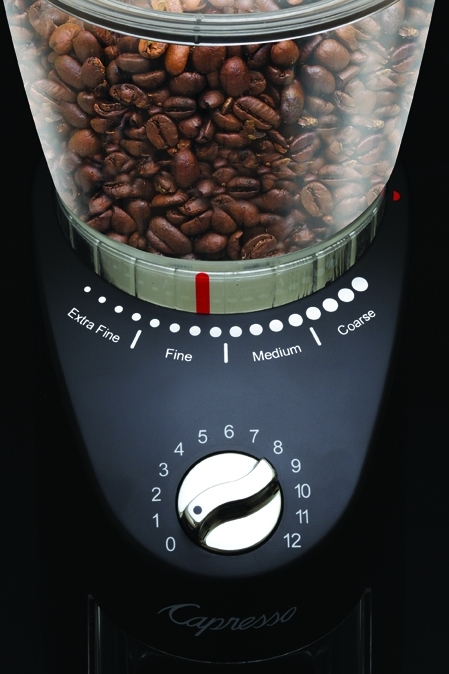 Easy to Clean In under a minute you can have the Infinity Plus completely cleaned and ready to grind again. 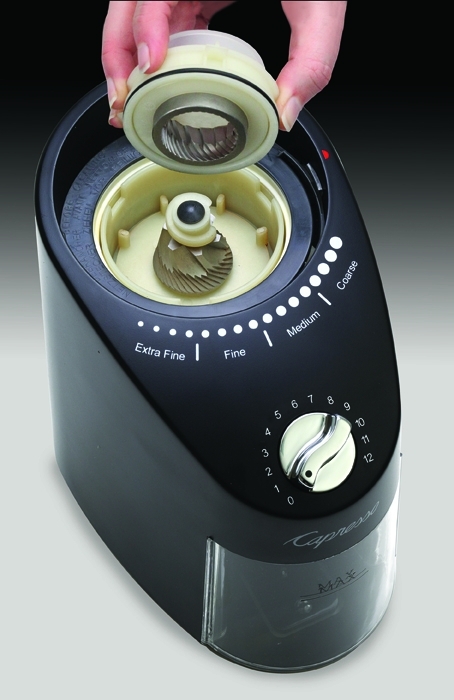 Remove the upper burr and clean inside the grinding chamber with the included brush. The sturdy ABS housing wipes clean with a damp cloth. Lots of flexibility and easy to use. You actually need less grind time per cup than timer dictates so you can just adjust for that. Conical grinder feeds well and after initial static it pretty much shakes out well. 1st coffee responded well to my order and I may buy other beans in the future. This is my second time for this brand and even thought the first was great this new generation is even better.